I returned to Gainesville this afternoon with a couple photography goals. 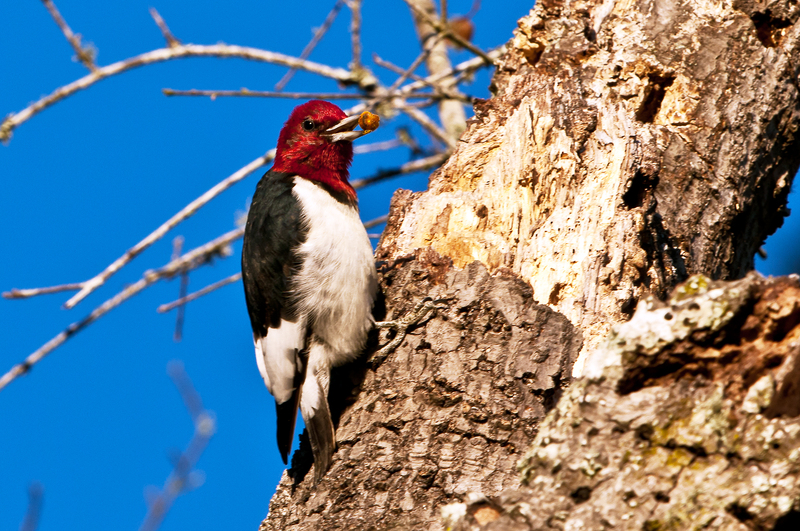 One was to photograph the Redheaded Woodpeckers at Prairie Creek Preserve. I arrived late in the afternoon, and the sun was in a perfect position lighting up an old dead tree where I saw the woodpeckers two weeks ago. The conditions were perfect, and before long several Redheaded Woodpeckers began flying in the trees around me. One landed on the old dead tree about 50 feet above the ground and began pecking at it. Eventually, the woodpecker pulled an acorn from a hole in the tree, and I was able to capture it with the acorn in its bill. In the fall, woodpeckers store acorns in dead trees by burying them deep into the tree to prevent them from being eaten by other birds. Below is one of the many images I captured of one of the woodpeckers. I will eventually upload more of these images to my website. Great photo! I used to love woodpeckers, until they started killing MY tree. I’ve never seen one of these, though. Just returned to VA from FL after 5 weeks down there. This the time of year to be in FL! I have tons of images to backup and process including many more Redheaded Woodpeckers. Comment: Great photo! I used to love woodpeckers, until they started killing MY tree. I’ve never seen one of these, though.